I asked Tussey what a customer should look for in a smith. “Most shops have a basic reliability package they like to sell. It’s often a ramp and throat and some chamber work. Many shooters think you can stop there, but I think a gunsmith who does is remiss in their job. “Part of my customer education is a careful explanation of what `needs’ to be done and what is `nice’ to have done. I carry that basic package further: bolt face work, extractor tuning, an oversized firing pin stop, which all Springfields and Series 70 Colts need, trigger, hammer and sear work, check the hammer strut, and weld and refit the magazine catch on Springfield pistols is a basic list. Some custom shops simply offer custom “packages” to choose from. 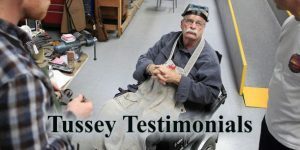 Tussey’s personal “just what each customer wants” approach is a sound one. Indeed, many customers wonder if the ramp and throat job on the $3,000 full-house “race gun” is any better than the one they are getting on their basic gun.